“When I would form an idea of a society in the highest degree happy, I think of them . . . sweetly singing to each other.” – Jonathan Edwards, Miscellanies, 188. The hallways and classrooms at Covenant are alive with the sounds of children singing. As one of the liberal arts that we study, music is a means by which we delight, wonder, and worship. This is expressed in the structure of our day, from our morning liturgy to our lunchtime doxology to our close of day hymn, as well as through our curriculum and electives. We enjoy both traditional and contemporary music, so you will find an abundance of violins at the school (all 5th and 6th grade students learn the violin) and also electric guitars. Covenant’s music program is directed by Mr. Jesse Maurer, whose passion for musical instruction inspires Covenant students to take up music and musical training as an integral part of life. Our students regularly enjoy music classes from Kindergarten through eighth grade. In grades 9-12, several additional courses are offered as electives. 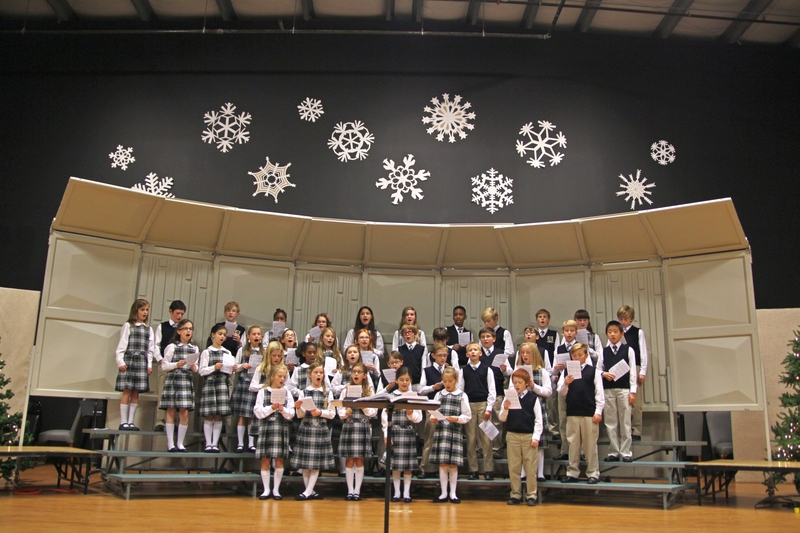 An abundance of ensembles are available to our students starting with the Treble Choir and Jr. Chamber Choir (grades 4-6). In 6th grade, students are able to join the orchestra. 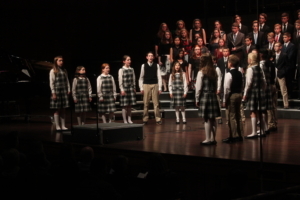 Throughout the Upper School years, (grades 7-12) students may elect to sing with the Mixed Choir, join the String Orchestra, or audition for the Chamber Choir. Other ensembles are occasionally added to these options, including Praise Band, Bluegrass, Jazz Band, Handbell Choir, and String Quartet. Keep scrolling to learn more about the different choirs and strings/orchestra offered at Covenant. We are so proud of our students for the hard work they have put into their musicianship. Congratulations to all! 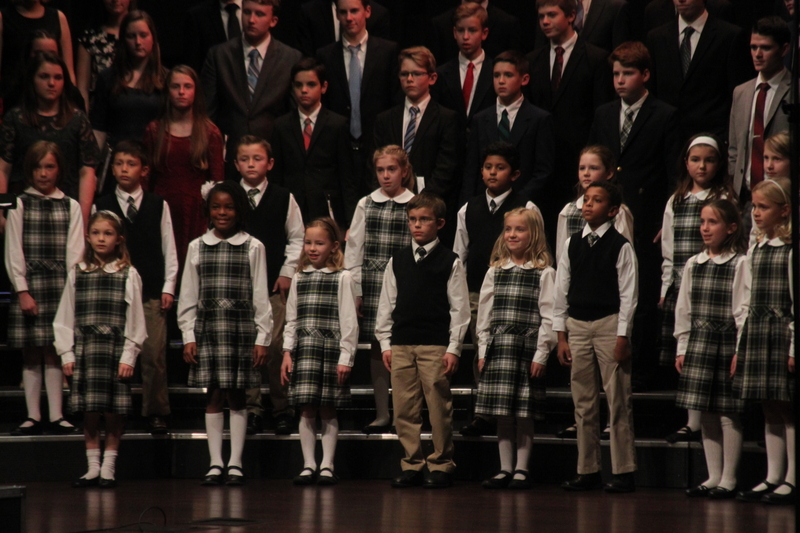 The Preparatory Choir is made up of the entire third grade class. This group rehearses throughout the Fall to prepare for a performance at the Festival of Lessons and Carols in December. 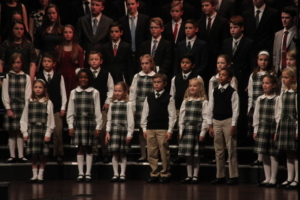 The goal of this choir is to teach young students the basics of choral singing before they reach the Treble Choir. The Treble Choir is made up of all students in grade four and anyone who elects to join choir in grades 5-6. This choir sings two and three part music accompanied and acapella. They rehearse once a week to prepare for regular performances at the Festival of Lessons and Carols in December and at the Spring Concert in May. Students from the Treble Choir may volunteer to be considered for membership in the Jr. Chamber Choir. Sixteen singers are selected for this choir based on their past performance in the school choirs and music classes. The Jr. Chamber Choir sings acapella music written for three to five vocal parts. 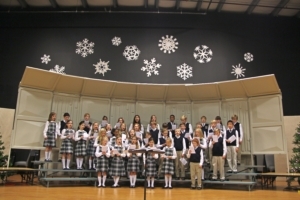 This choir regularly performs at the Festival of Lessons and Carols in December and at the Spring Concert in May. 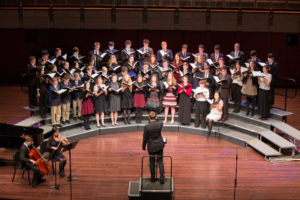 Upper School students are invited to join the Mixed Choir. The eagerness of our students to sing is clearly evidenced by the number of singers that volunteer to join this choir. They sing both accompanied and acapella music written for 4-8 vocal parts. 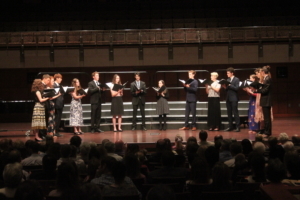 This choir has performed original compositions of Lotti, Praetorius, Bach, Vivaldi, Handel, Mozart, Rachmaninoff, and Vaughan Williams, as well as the Spirituals of Moses Hogan, William Dawson, and a few others. It has also enjoyed folk music from Russia, Africa, Czechoslovakia, and England (to name just a few). The choir learns a large scale masterwork every few years (Mozart’s Requiem 2015, Vivaldi’s Gloria 2018). Members of this choir rehearse twice a week: once with either the men or women of the choir and once all together. They regularly perform at the Festival of Lessons and Carols in December, at the Spring Concert in May, and at Graduation. All students in the Mixed Choir are eligible to audition to be one of the sixteen voices Chamber Choir. This choir sings all acapella music written for 4-8 vocal parts. Singers are challenged with higher expectations in musicianship, leadership, and independence. They sing a wide range of musical repertoire including the classics, folk music, spirituals, as well as music using more modern harmonic techniques. They have even been known to enjoy singing barbershop, jazz, and occasionally a tune from the Beatles. 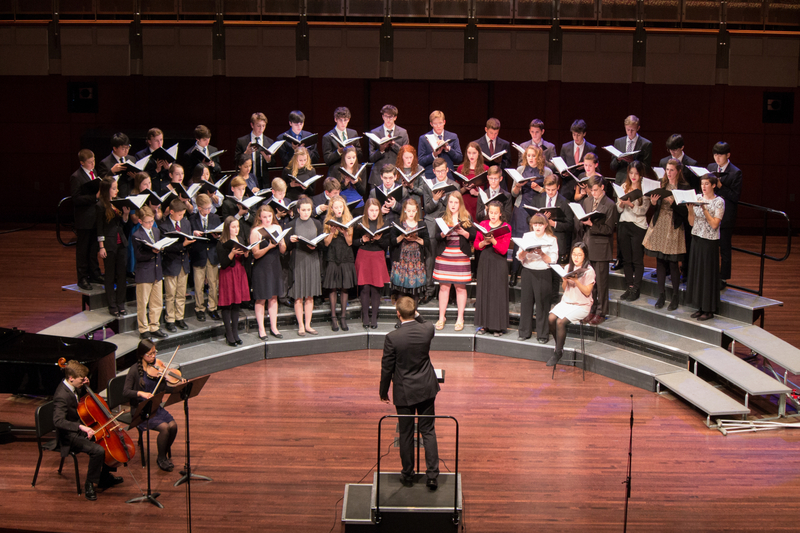 The Chamber Choir regularly performs at the Evening of Gratitude in November, the Festival of Lessons and Carols in December, the Chamber Music Concert in February, the Medieval Feast in February, the Spring Concert in May, and at Graduation. They also break into smaller groups to perform often in our hallways and are invited to sing the national anthem at our sporting events. This group has performed on occasion in our broader Harrisburg community including the National Anthem for the Harrisburg Senators. 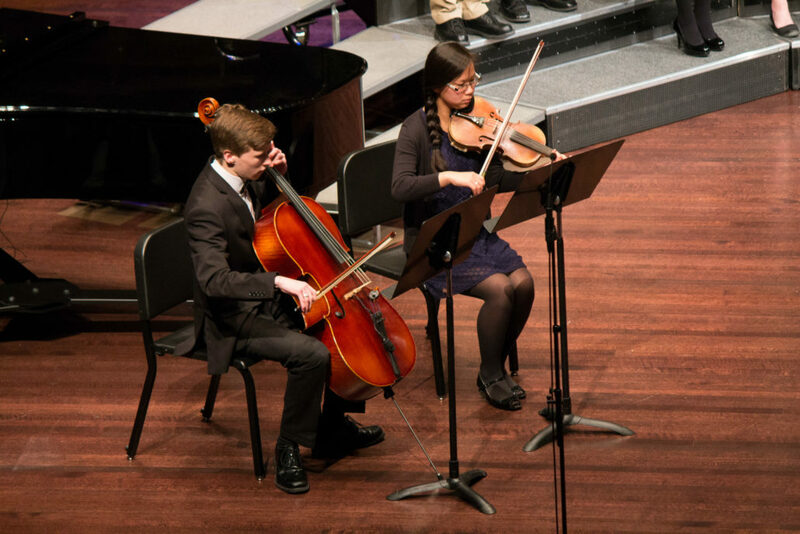 Covenant students have ample opportunity to grow as musicians in our string ensembles. At Covenant, we highly value music literacy. One of the ways we help our students grow in literacy is through our string program. Every student receives a violin in fifth grade and participates in small group lessons. Once in sixth grade, students are free to try other string instruments and will all participate in the sixth grade string orchestra. As they enter the Upper School, our young string players are free to choose what musical ensembles they will take part in. Mr. David Pra leads our Upper School string orchestra which is open for continuing string players.